This article is about the ancient Egyptian symbol. For the video game, see Eye of Horus (video game). The Eye of Horus, also known as wadjet, wedjat or udjat, is an ancient Egyptian symbol of protection, royal power, and good health. The Eye of Horus is similar to the Eye of Ra, which belongs to a different god, Ra, but represents many of the same concepts. Funerary amulets were often made in the shape of the Eye of Horus. The symbol "was intended to protect the pharaoh [here] in the afterlife" and to ward off evil. Ancient Egyptian and Middle-Eastern sailors would frequently paint the symbol on the bows of their vessels to ensure safe sea travel. Horus was the ancient Egyptian sky god who was usually depicted as a falcon, most likely a lanner or peregrine falcon. His right eye was associated with the sun god, Ra. The eye symbol represents the marking around the eye of the falcon, including the "teardrop" marking sometimes found below the eye. The mirror image, or left eye, sometimes represented the moon and the god Djehuti (Thoth). It was believed by the Greeks and Romans that an evil heart could get to the eye. The thought to be powerful effects of eyes and optics created the myth that the energy-producing power of the eye had the ability to cast evil spells with just a glance. Because the ancients believed the evil eye could be counteracted with a 'good eye', myths about Horus arose. In one myth, when Set and Horus were fighting for the throne after Osiris's death, Set gouged out Horus's left eye. The majority of the eye was restored by either Hathor or Thoth. When Horus's eye was recovered, he offered it to his father, Osiris, in hopes of restoring his life. Hence, the eye of Horus was often used to symbolise sacrifice, healing, restoration, and protection. There are seven different hieroglyphs used to represent the eye, most commonly "ir.t" in Egyptian, which also has the meaning "to make or do" or "one who does". In Egyptian myth the eye was not the passive organ of sight but more an agent of action, protection or wrath. The Eye of Horus was represented as a hieroglyph, designated D10 in Gardiner's sign list. It is represented in the Unicode character block for Egyptian hieroglyphs as U+13080 (𓂀). In Ancient Egypt, most fractions were written as the sum of two or more unit fractions (a fraction with 1 as the numerator), with scribes possessing tables of answers (see Rhind Mathematical Papyrus 2/n table). Thus instead of ​3⁄4, one would write ​1⁄2 + ​1⁄4. The Rhind Mathematical Papyrus contains tables of "Horus Eye Fractions". ^ Pommerening, Tanja (2005). Die altägyptischen Hohlmaße. Studien zur Altägyptischen Kultur. Beiheft 10. Hamburg: Helmut Buske Verlag. ^ Stokstad, Marilyn (2007). "Chapter 3: Art of Ancient Egypt". Art History. Volume 1 (3rd ed.). Upper Saddle River, N.J.: Pearson Prentice Hall. ISBN 9780131743205. OCLC 238783244. ^ a b c Silverman, David P. (1997). "Chapter 14: Egyptian Art". Ancient Egypt. Duncan Baird Publishers. p. 228. ^ Bongioanni, Alessandro; Croce, Maria, eds. (2003). The Treasures of Ancient Egypt: From the Egyptian Museum in Cairo. Universe Publishing. p. 622. According to the editors, "Udjat" was the term for amulets which used the Eye of Horus design. ^ a b Butler, Edward P. "Wadjet". Goddesses and Gods of the Ancient Egyptians: A Theological Encyclopedia. Henadology: Philosophy and Theology. Retrieved October 4, 2010. ^ Freeman, Charles (1997). The Legacy of Ancient Egypt. Facts on File. p. 91. ^ "Eye of Horus, Eye of Ra (Udjat, Wedjet)". Symboldictionary.net. Retrieved 2012-01-17. ^ Bohigian, G. (1997). The history of the evil eye and its influence on ophthalmology, medicine and social customs. Documenta Ophthalmologica, 94(1), 91-100. ^ Zaslavsky, Claudia (1993). Multicultural Mathematics: Interdisciplinary Cooperative-Learning Activities, p. 20. ISBN 9780825121814. ^ Stewart, Ian (2009). Professor Stewart's Hoard of Mathematical Treasures. Profile Books. pp. 76–80. ISBN 978 1 84668 292 6. ^ Ritter, Jim (2002). "Closing the Eye of Horus: the Rise and Fall of 'Horus-Eye Fractions'". In Steele, J.; Imhausen, A. (eds.). Under One Sky: Astronomy and Mathematics in the ancient Near East. Münster: Ugarit-Verlag. pp. 297–323. See also Katz, V., ed. (2007). The Mathematics of Egypt, Mesopotamia, China, India, and Islam: A Sourcebook. Princeton: Princeton University Press, and Robson, E.; Stedall, J., eds. (2009). The Oxford Handbook of the History of Mathematics. Oxford: Oxford University Press. 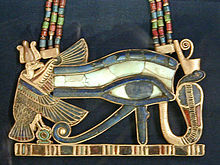 Wikimedia Commons has media related to Eye of Horus.